Santa Casa Retreat Centre, Queenscliff, Victoria, has opened its doors to the women of McAuley House, Footscray. Residents of McAuley House, who have been left homeless as a result of family violence or mental illness, were welcomed by Santa Casa Manager Lizzie Finnerty RSM, for a time of respite at the relaxing seaside. Catherine McAuley focused on caring for women, especially those who were vulnerable, and the same spirit has inspired this Santa Casa initiative. It has been a long term dream of Lizzie, Manager of the Retreat Centre, who organized two ‘Mini Holidays’. Eleven women took up the invitation. During their days together they shared their stories and strengthened their bonds. Sisters Margie Abbott RSM and Nicole Rotaru RSM were co-opted to be part of the venture. They provided a safe space for the women to share with each other, facilitating conversation through various activities. 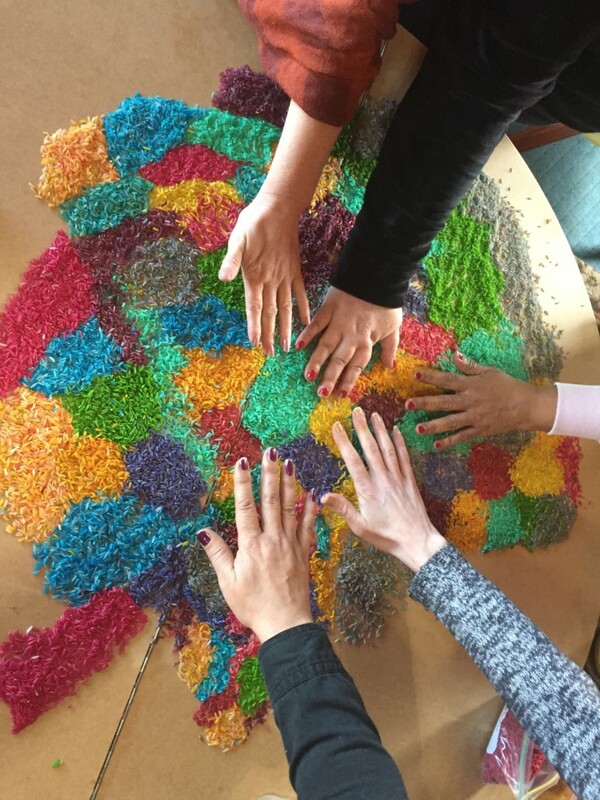 The gathering space was filled with chatting and laughter as the women designed placemats and participated in creating a mandala with coloured rice. After reflecting on what had been created everyone collected some rice to take home and cook for themselves. Another activity which the women shared focused on their name. Each woman was asked to write her name on a piece of paper. All other women were encouraged to write one positive sentence about each other and place these down next to the respective name. The women were also offered massages by a Geelong Reflexologist who said she gained as much as she gave to these brave women. Lizzie applied and received funding for the two ‘Mini Holidays’ from Mercy Action Support Fund (MASF). A $1000 grant contributed to the food and activity costs for both escapes. Santa Casa Retreat Centre covered the difference. McAuley House is run by McAuley Community Services for Women.